Have some Turkish delight. If you betray you family, there's more where that came from. Wow. This is... not great. 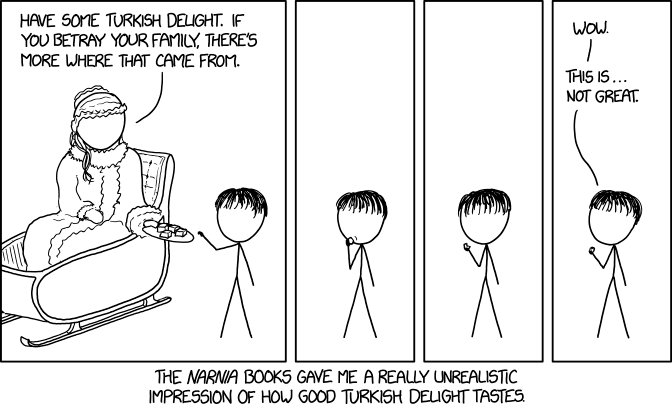 The Narnia books gave me a really unrealistic impression of how good Turkish delight tastes. Having tasted Turkish Delight IRL, its really not that great. So what was Lewis' fascination with it, and why did he present it as if it was the end-all-be-all of candy? The question of Turkish Delight often becomes still more perplexing when a young Narnia fan actually eats the stuff, and finds that it does not live up to Edmund’s rapturous praises. As with so many things in pop culture, the answer lies in the context, and since we’re living in a beautiful future, an academic article has stepped in to tell us all about the importance of Delight. 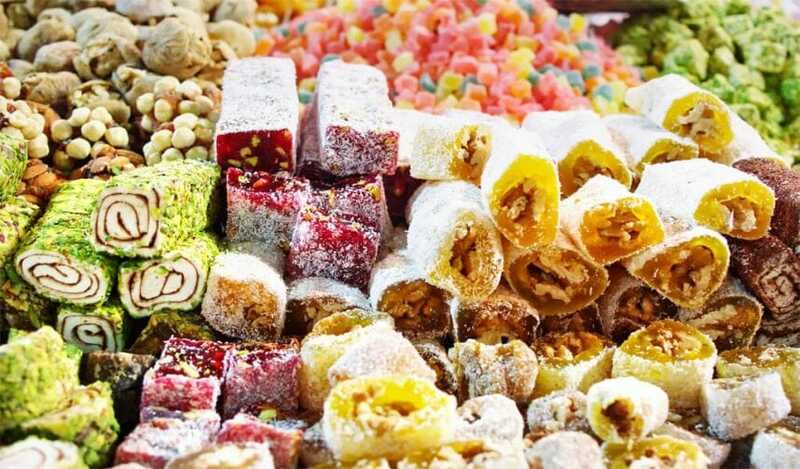 According to food critic Cara Strickland, the Turkish sweet cast an intoxicating spell over late-Victorian England. Made from a confection of rose oil and sugar, the candy is simple on paper, but proves extremely difficult to make – no matter how Western Europeans tried, they never quite replicated it. Thus, if you wanted real Delight, you had to import it from Turkey, which got expensive fast, so that it became a marker of either status or indulgence in much the way the way coffee had a century earlier. Of course just as costs had gone down, the outbreak of World War II and its subsequent rationing meant that the candy was harder than ever to come by. Perhaps this is why it became so significant to Lewis? As he welcomed refugee children into his Oxford neighborhood, he thought back on the candies and holidays that had marked his own childhood. It makes sense that Turkish delight would have been on Lewis’s brain as he crafted a book where Christmas features as a main theme. In Narnia, it is “always winter and never Christmas,” a product of the White Witch’s evil magic. It makes sense to draw a parallel between this dismal fantasy and the stark realities of wartime. Rationing extended to timber, which made Christmas trees harder to come by, and confectionery rationing didn’t end until February of 1953—still well before the end of sugar rationing later that year. When the White Witch asks Edmund what he’d like best to eat, it’s entirely possible that Lewis was answering for him: the candy that would be most difficult and expensive to obtain. Edmund isn’t just asking the witch for candy, he’s essentially asking her for Christmas, too. The article I've referenced summarizes and cites from an article written by Cara Strickland. She goes far more in depth into the matter, including pointing out Lewis' fascination with Turkish culture (Aslan is apparently the Turkish word for Lion, for example). It's far too long and detailed to include though, so I recommend checking it out directly if you want to go deeper. So it was essentially both a cultural delicacy at the time, and as the article speculates, likely something of specific connection to Lewis himself. It should be remembered that until Edmund asked for Turkish delight, Jadis had very likely never heard of it at all, and so the enchantments she used to create it were running on his ideas about it. It was already Edmund's favorite candy (or he would have asked for whatever his favorite candy was and we would be talking about that), and he could have been envisioning it as more enjoyable than his actual experience warranted. And since the whole point of offering it to him was to hook him into her schemes, she amped up the pleasure of eating it. Beside the delightfullness of some brands of Turkish Delight according to some of those who have answered here, there is also the Turkishness of Turkish Delight to considered. If Communist Cookies, or Nazi Nougat, or Stalinist Sweets, or Enemy Eclairs, or Anarchist Apple Fritters, had been a popular band of candy or sweets when Lewis was writing, he might have chosen them for Jadis to tempt Edmund with, for the sake of their sinister sounding names. But if Lewis was limited to using a real and familiar type of sweets, I guess that the name of Turkish Delights might have had the most sinister and hostile connotations of any real type. Various Turkish realms had been feared threats to various Christian and/or European societies for six hundred years up to the Great Turkish War of 1683 to 1699 when their conquests in Europe began to be reversed. The only reason that he could not stop eating it is because it was enchanted. As I recall (having read the book recently, though I don't have it at hand now) there's a point where Edmund is looking longingly at the empty box, and the witch is not surprised, since the treats were enchanted. While I support the answer of Mwr247 for important context (even if it largely lifts from another source that lacks a clear CC license), I came across an interesting answer for this question years ago at a diverse table of people from many countries. The Turkish representative had brought a box of Turkish delight, imported from Turkey, and thus labeled in its original Turkish language ("Lokum"). This was touted as the real thing; I'd finally get to learn after years of waiting just what Edmund (Lewis) was referring to. The Danish representative, arriving a few moments later, laughed and commented that in his language, the word means "toilet." So even linguistically, we were set up for the experience of the dessert being a welcome treat but not nearly as amazing as Edmund described it, in comparison and context with a modern peacetime of relative abundance where a wide variety of sweets and rich foods are relatively easy to come by. If Lewis knew this, this particular choice of treat could have been a hidden reference to something which seems quite attractive on its surface but has a much dirtier true meaning underneath. With evacuated Danish children in wartime England, real Turkish delight something that would have to be imported (according to Leah Schnelbach's article quoted by Mwr247), and the higher average number of languages Europeans are familiar with (compared to residents of other English-dominant countries), it would not necessarily be that unusual for Lewis or at least some of his readers to pick up on this connection. His writing style puts meaning on so many different levels and layers, that I would not be entirely surprised if this was intentional. Also, he could not have conveyed that meaning with any other choice of treat, so it lends a bit more weight to the possibility that the extra layer of meaning may have been intended. In a later reading of the particular section quoted in the question, I also interpreted "Turkish Delight" as a code for addictive drugs (e.g. opiods) that also make one forget one's manners, think only of trying to shovel down as much as one can, where the more one consumes the more one wants to consume. Lewis's goal of embedding morals and lessons important for young people to learn would likely have included strong cautions against this sort of substance, even if is something that sounds exotic and tempting, because such drugs lead to one's downfall and hurt one's family. Possibly due to how the writing works as Turkish delight is a very specific food for a westerner to imagine. If I say chocolate you are imagining a vague concept of twenty plus types but you have probably only had Turkish delight a few times and it makes the reader imagine the food with much more clarity. Not the answer you're looking for? Browse other questions tagged behind-the-scenes narnia cs-lewis xkcd or ask your own question. Why did C.S. Lewis use Turkish references including “Aslan”? In C.S. Lewis' Narnia stories, how was “Calormen/Calormene” originally pronounced? Did they use models or CGI for the spaceships in The Force Awakens? Did CS Lewis ever write other Narnia works? Did C.S. Lewis create the lamp-post in response to a comment by J.R.R. Tolkien?